If you have a drivers license and are 25 or older, we will provide the rest! Click on our Rental Agreement to download. Be sure to complete and bring with you. No Boater’s License Required! 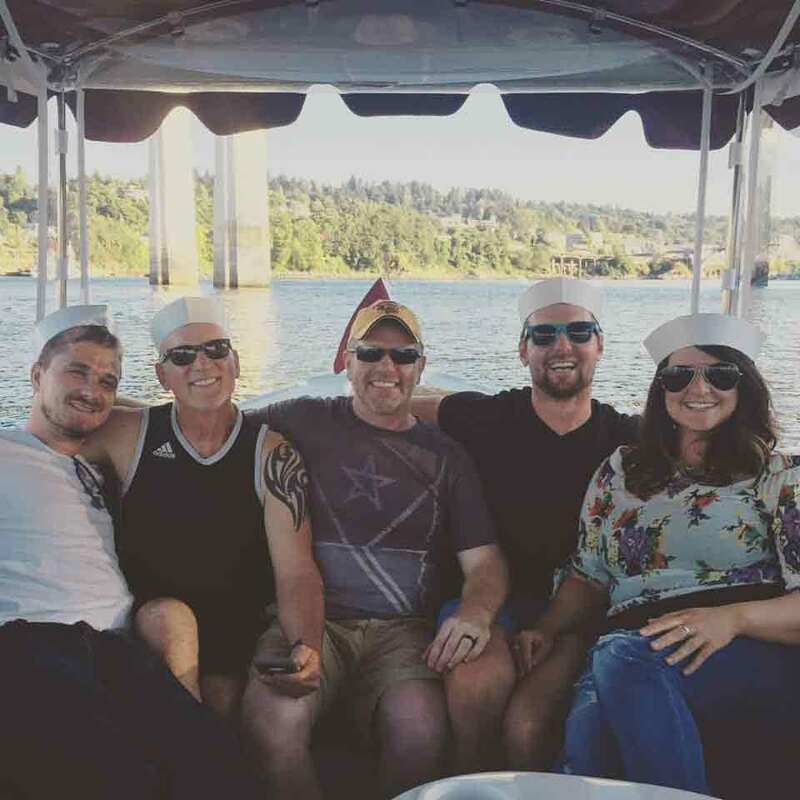 Corporate events, birthdays, anniversaries, romantic occasions….. your event is even more special when cruising the Willamette River on a quiet, easy to captain electric boat. The boats are equipped with clear shades that protect you from the weather. Our active season generally begins May 1st through September 30th. Click below to use our online reservation calendar. 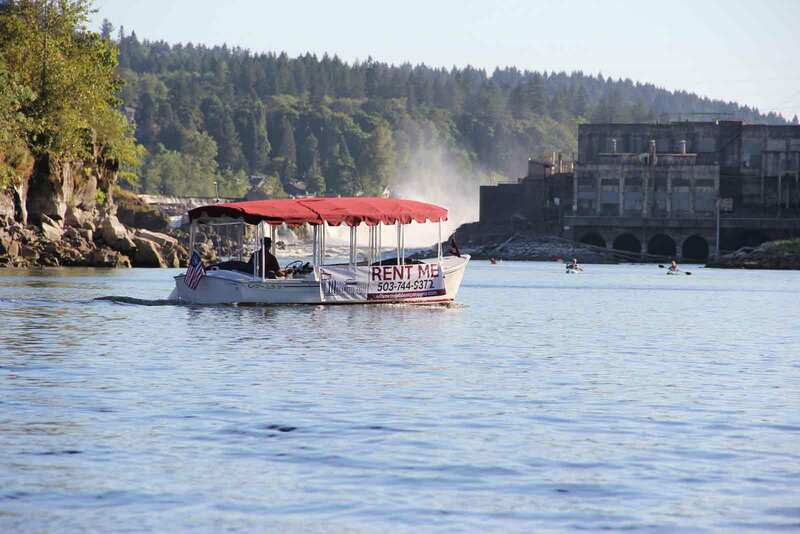 OR CALL 503-744-9372 TO RENT A DUFFY ELECTRIC BOAT TODAY! Please arrive at least 15 minutes early! Do I need a boater's license? Nope! 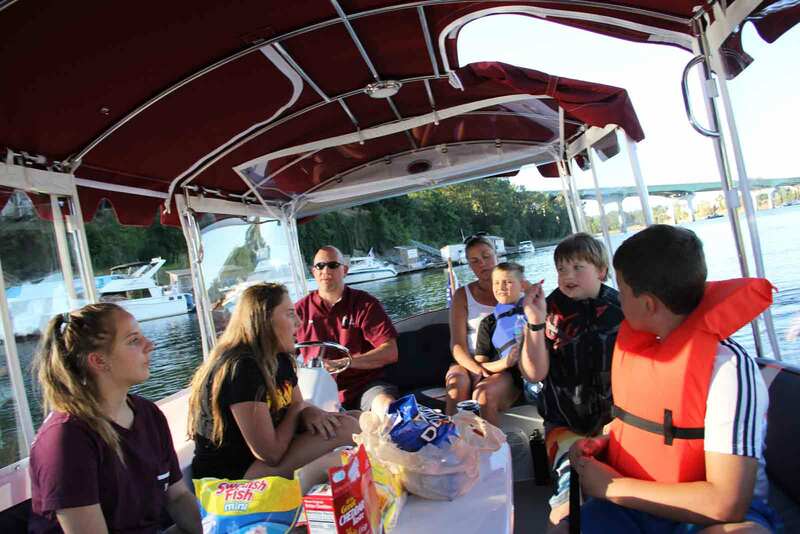 The boat captain will need to be 25 and have a current Driver’s License, but a boater’s license is not required. Boat rentals are $99 per hour. You can rent the boat for a maximum of 6 hours. What is the music set up? Each boat is equipped with a stereo system. You are welcome to connect your phone/mp3 player with an auxiliary cord or Bluetooth or just listen to the radio. How easy are the boats to drive? The boat is as easy to drive as a golf cart and cruises at 6 mph. You must be 25 years old and have a valid driver’s license to captain the boat. No Oregon Boaters license is required. Before you depart, we will give you a quick briefing about how to drive the boat and where to go. Where can I go during my rental time? 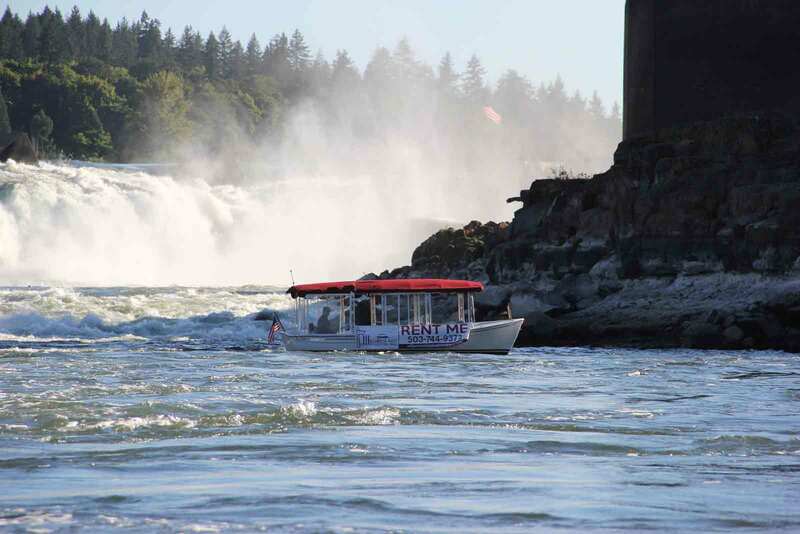 You may travel along the Willamette River and get closer to Willamette Falls on the water than you could on land! Maps will be provided showing 90 minute and 2, 3, 4 and 6 hour tours. Are there bathrooms on the boat? There are no bathrooms on the boat. Public bathrooms are located in Jon Storm park just before the entrance to the dock (see map on homepage). We will provide locations along the tours you may dock and use the restroom. How many people fit on a boat? Each boat will accommodate 12 adults. The boats have full window enclosures that can be up or down depending on the weather. We do recommend bringing layers, especially if you tend to get cold on the water. Yes. Oregon Marine law requires children 13 years of age and under to wear a life jacket at all times. Adult life jackets are stowed in an easily accessible storage compartment on the boat. There is a full USCG safety kit aboard each boat. There is a strict 24-hour cancellation policy. If you do not cancel before 24 hours of your scheduled departure time, you will be charged the full rental price. 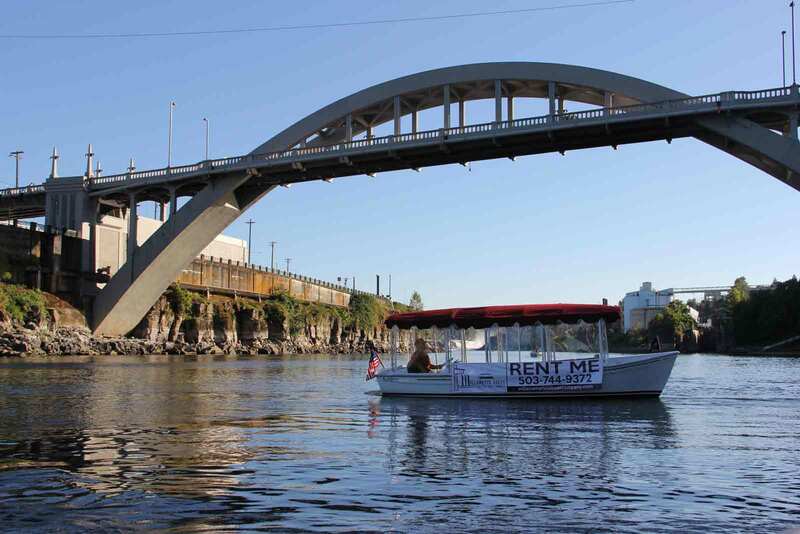 Should a manager deem the weather to be unsafe for navigating the Willamette River prior to departure, a full refund will be given. 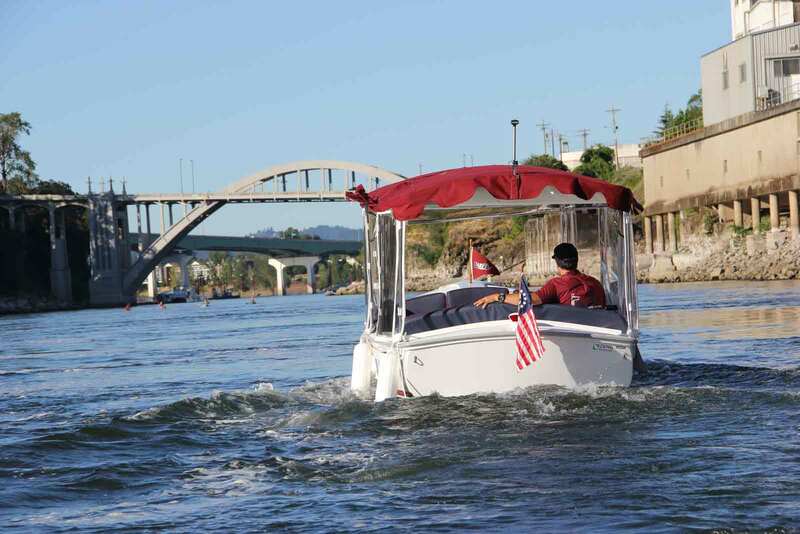 Only a Willamette Falls Electric Boat Company manager can make this decision. Please note that rain does not mean the weather is “unsafe”. Each of our boats are fully enclosed to keep you warm and dry in the event of rain. Where do we meet your contact person to pay and get on the boat? A crew member will meet you on the dock of Jon Storm Park 15 minutes before your scheduled rental time. There will be an orientation on how to operate the boat and review Oregon Safe Boating Regulations. If you have not paid, this will be done at this time and you will have some paperwork to complete. Your party will be picked up at Jon Storm Park loading dock in Oregon City. What should I bring on the day of rental? It is very important to arrive at least 15 minutes prior to your scheduled departure time and have a printed copy of the Rental Agreement. The designated Captain of your crew must show a valid driver’s license. Please bring a major credit card for a $500 security authorization and method of payment. You may bring food and drinks aboard. Alcoholic beverages are allowed, however you must follow Oregon law. Currently, Oregon law states that the designated Captain is not allowed to consume alcohol. There are many great restaurants in downtown Oregon City where you may purchase food. Can I load and/or decorate the boat while I wait for the rest of my party to arrive? You cannot access the boat(s) until everyone in your party is present and you are ready to depart the dock. If part of your party is going to be late, you may load the boat, depart the dock and return to the dock to pick them up when they arrive. You may not sit on the boat at the dock and wait. Am I allowed to bring pets on the boat? Sorry, pets are not allowed. There are exceptions for service animals that fall under ADA’s definition of a service animal. How old does the designated Captain have to be? You must be 25 years or older with a valid driver’s license. There are no exceptions to this rule. The designated Captain is not allowed to consume alcohol or drugs prior to or during the cruise. Items not allowed on the boat include, illegal drugs, anything that can be lit (i.e. BBQ’s, cooking heaters, candles, cigarettes, cigars, vapors, etc. ), explosive/flammable materials (i.e. fireworks), flammable liquid/gas/aerosol paint and/or dangerous chemicals. There is NO SMOKING or VAPING on the boats.